On November 20, 2014, the Federal Energy Regulatory Commission (FERC) issued a proposed Policy Statement regarding Cost Recovery Mechanisms for Modernization of Natural Gas Facilities (Proposed Policy Statement). The Proposed Policy Statement would permit interstate natural gas pipelines to establish a tracker or surcharge mechanism to recover facility upgrade costs related to anticipated pipeline safety, reliability, and environmental regulations, if certain standards are met. The proposal represents a modification of FERC policy, which previously rejected pipeline safety and environmental cost trackers that were not agreed to as part of a unanimous settlement with the pipeline’s customers. The Proposed Policy Statement explained that FERC’s proposal was informed by the Columbia Gas Transmission LLC (Columbia) Capital Cost Recovery Mechanism (CCRM), which the Commission approved in 2013 following a contested settlement between Columbia and its shippers (Van Ness Feldman represented Columbia in the CCRM settlement proceeding before FERC). If adopted, the Proposed Policy Statement would provide a CCRM-based framework outside of a Natural Gas Act (NGA) section 4 rate case for pipelines to recover certain capital costs that are not included in their base rates. Initial comments on the proposal are due 30 days after publication in the Federal Register with reply comments due 20 days later. Review of Existing Rates – the pipeline’s base rates must have been recently reviewed in a NGA general section 4 rate case or through a collaborative effort between the pipeline and its customers. FERC will consider tracker filings that are part of a new NGA general section 4 rate filing or a cost and revenue study. Eligible Costs – a pipeline may only recover one-time capital costs incurred to modify the pipeline’s existing system to comply with EPA, PHMSA, or other federal or state government agency regulations, or as necessary for the safe or efficient operation of the pipeline. Pipelines must specifically identify each capital investment to ensure that the included costs are not normal capital maintenance expenditures, but rather are necessary to address system safety, efficiency, and other related items. FERC also proposes that pipelines specifically identify the projects eligible for recovery, the facilities to be upgraded or installed, and an upper limit on the capital costs related to each project. Avoidance of Cost Shifting – the proposed surcharge must be designed in a manner that protects captive customers from cost shifts in the event the pipeline loses customers, or must discount its rates to retain business. The CCRM accomplished this by placing the pipeline at risk for a set level of billing determinants. Periodic Review of the Surcharge – the pipeline must include some method to allow for the periodic review of whether the surcharge and the pipeline’s base rates remain just and reasonable. The Columbia CCRM expires automatically after five years, and the settlement requires Columbia to make a new NGA section 4 filing if it wants to continue the surcharge. Shipper Support – the pipeline must work collaboratively with shippers to seek shipper support for any surcharge proposal. However, FERC will not require 100% shipper support for approval of a proposed cost recovery mechanism. FERC requests comments on these standards as well as related issues, including whether a modernization surcharge could or should cover: (1) compressor modification costs related to waste heat recovery; (2) certain expansion facility capital costs; (3) costs for voluntary action that minimize facility emissions; (4) non-capital maintenance costs associated with environmentally-sound compressor operations; and (5) costs of additional projects not identified in the initial tracker filing. FERC also seeks comments on the use of accelerated amortization methodologies to recovery modernization costs. In addition, FERC asks whether it should modify its reservation charge crediting policies, which currently permit partial reservation charge credits for one-time outages related to compliance with government orders. In the past, FERC has found pending PHMSA and EPA regulatory initiatives to be too speculative to merit the implementation of a tracker or surcharge cost recovery mechanism, except when agreed upon as part of a settlement. 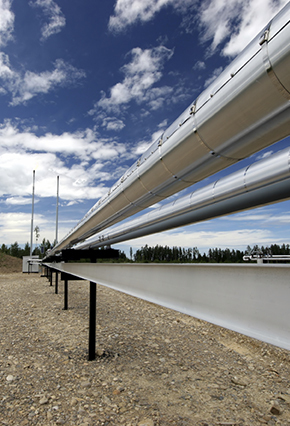 FERC’s pivot towards trackers for regulations that have not yet issued follows Secretary of Energy Ernest Moniz’s July 31, 2014 letter to the FERC Chairman recommending that FERC “explore efforts to provide greater certainty for cost recovery for new investments in modernization of natural gas transmission infrastructure” consistent with its mandate of ensuring “just and reasonable natural gas pipeline transportation rates.” In July 2014, the White House and the U.S. Department of Energy announced a series of actions, partnerships, and stakeholder commitments to help modernize the nation’s natural gas transmission and distribution systems and designed to reduce methane emissions as part of the Capstone Methane Stakeholder Roundtable. PHMSA expects to issue a proposed rule in May 2015 that will overhaul pipeline safety regulations for gas transmission lines. The Proposed Policy Statement is significant because FERC rarely makes exceptions to its general policy disfavoring trackers for costs other than fuel. FERC has stated that it generally does not permit a pipeline to change one element of its cost-of-service outside of a general NGA section 4 rate case. Outside of settlements, trackers generally have been limited to pipeline fuel costs. Although, FERC has permitted pipelines to initiate surcharges to recover capital costs related to damaging storms like Hurricane Katrina, or in advance of future hurricanes, FERC has never before announced that it would permit a tracker in advance of anticipated regulatory changes to address compliance costs. It is also important to note that although specific projects may be identified as qualifying for cost recovery through a tracker, each contemplated project must still be authorized by FERC under NGA section 7 before it can be constructed. The FERC policy could have important implications for how pipelines address potential methane regulations or voluntary methane emission reduction programs. An April 2014 White House Methane Strategy directed EPA to determine by the end of the year whether to regulate methane emissions from the oil and gas sector. In July, the White House and the U.S. Department of Energy announced a series of actions, partnerships, and stakeholder commitments to help modernize the nation’s natural gas transmission and distribution systems and reduce methane emissions as part of the Capstone Methane Stakeholder Roundtable. Recent statements by EPA Administrator Gina McCarthy suggest that EPA is evaluating both new regulations and also enhanced voluntary policies. It is possible that EPA will opt to address methane emissions from the pipeline sector primarily through voluntary policies, including through an expanded Gas Star Gold program. In that case, pipeline companies may have an interest in advocating to FERC that its proposed tracker policy should apply not only to regulatory costs, but also to costs incurred to meet the requirements for participating in a federally-established voluntary methane reduction program. This is one of the topics for which the Proposed Policy Statement specifically seeks comments. The Proposed Policy Statement explained that FERC does not want its existing ratemaking policies to “unnecessarily inhibit interstate natural gas pipelines’ ability to expedite needed or required upgrades and improvements.” The proposal signifies FERC’s willingness to allow pipelines to proactively address infrastructure modernization costs, which currently are unrecoverable outside of a general rate case filing or settlement. The recovery of modernization costs has become a larger issue given the increasing age of a substantial portion of the pipeline infrastructure in the U.S. Facility age was a primary factor that influenced Columbia’s development of the CCRM. Van Ness Feldman closely monitors federal and state developments on natural gas pipeline regulation and safety issues, as well as climate change, air quality, and energy policy. Our professionals provide expert analysis and advice on the implications of emerging legislation and regulatory activity, and the surrounding policy and political debate. For more information on FERC’s Proposed Policy Statement, please contact any member of the firm’s Pipeline & LNG, Pipeline Safety, or Environment, Air or Climate Change practices at (202) 298-1800.